Receive 15% off any cable and 20% off any board with purchase of select devices. Discount applied at checkout. The Beagle™ USB 5000 SuperSpeed Protocol Analyzer, the winner of Best in Test 2012, is a world-class USB 3.0 bus monitor that provides real-time interactive capture and analysis of USB 3.0 and USB 2.0 traffic (up to 5 Gbps). The Beagle™ USB 5000 v2 SuperSpeed Protocol Analyzer - Ultimate Edition is our newest flagship model. Building upon the success of the award winning Beagle™ USB 5000 SuperSpeed Protocol Analyzer, the Ultimate model is a state-of-the-art USB bus monitor that provides real-time capture and analysis of USB 3.0 and USB 2.0 data. By adding a USB 3.0 downlink and multi-analyzer synchronization to the platform, we have created a blazing fast, advanced tool, which is loaded with interactive and flexible features for even the most experienced USB developer. Free Data Center Software and cross-platform support for Windows, Linux, and Mac OS X make the Beagle USB 5000 v2 analyzer - Ultimate edition a user-friendly and versatile tool for any engineer working with USB 3.0 or USB 2.0. If you are still not sure which features are perfect for your application, please see our USB Product Comparison chart. Not sure you need all the features in the Ultimate edition yet? Please call or email so we can configure the most cost-effective analyzer for your needs. Detailed technical information about the Beagle USB 5000 v2 Protocol Analyzer - Ultimate Edition can be found in the User Manual. We also have a Quick Start Guide to help you get started. Non-intrusively monitor USB 3.0 and USB 2.0 and interactively analyze the data as soon as it is captured on the bus. Avoid engineering bottlenecks caused by waiting for captured data to be downloaded and parsed. Developers can repeatedly disconnect and reconnect a device or iteratively exercise it and see the resulting USB traffic immediately, saving time and reducing frustration. There is no need to reset the analyzer, restart a capture, and wait for all the data to be downloaded and parsed again and again. Filter and quickly search for data of interest while the capture is still running. Utilize the real-time statistics function of the Data Center Software to view packets and errors on the bus. All Beagle USB 5000 models feature Infinite Capture, our solution that enables users to capture more data than is stored in their on-board buffer. Data is continuously streamed from the standard 4 GB buffer to the analysis PC, allowing total capture size to far exceed the hardware buffer memory. Since the bulk of USB traffic occurs in bursts, the Ultimate model analyzer can quickly catch up with the USB analysis traffic via it's standard USB 3.0 downlink and free buffer space for more data. USB data is easier to understand with real-time decoding of class-level data. Class-level decoding is automatic – no need to wait for the capture to download and apply decoding. The Data Center Software supports multiple USB classes. For USB classes not included in this list, developers can save USB configurations to apply decoding after the capture. Match/Action triggering and filtering allows developers to trigger the capture, filter data, or set external triggers by matching data patterns, packet types, error types, and more. Create flexible state-based event triggers with up to 8 independent states and 6 matches per state for USB 2.0 captures. Advanced multi-state triggers and filters for USB 3.0 captures are available with the USB 3.0 Advanced State-Based Matching Option. Applications may require multiple analyzers for monitoring data transfers across the system. With the advanced sync feature, engineers can create multi-analyzer scenarios to measure latency across the whole system with a level of precision previously unattainable. Enable longer captures with the USB 3.0 downlink. Working with Total Phase's real-time display, USB 3.0 data is captured and displayed at a much faster rate. There's no wait time for data to be downloaded; data is shown immediately on screen. Trigger an output to a scope or logic analyzer and gain an even better understanding of your system. The Beagle USB 5000 v2 SuperSpeed Protocol Analyzer Ultimate provides dedicated USB 3.0 input and output to synchronize with external equipment. 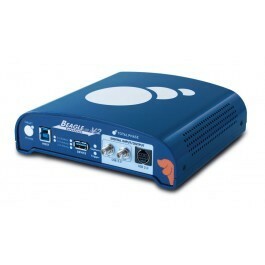 The Beagle USB 5000 v2 analyzer Ultimate also offers four digital inputs and four digital outputs dedicated to USB 2.0. Easily share data with your colleagues around the world using the freely downloadable Data Center Software. Send saved captures to your colleagues, and they can view the data exactly as you see it. How do I Manually Control the Receiver Termination Detection System of the Beagle USB 5000 v2 SuperSpeed Protocol Analyzer? How Do I Successfully Connect the Beagle USB 5000 v2 SuperSpeed Protocol Analyzer to an Embedded Device where the System Provides No VBUS? Can I Manually Control the Rx Receiver Termination of the Beagle USB 5000 Protocol Analyzer Instead of Using the Default Auto-Detect? With the Beagle USB 5000 v2 Protocol Analyzer, How Do I Filter and Capture Only the LTSSM Transitions from a UVC USB Video Class Device and Save the Data on a Hard Drive? Beagle USB 5000 SuperSpeed Protocol Analyzer Selected as a Finalist in TMW's Best in Test Award!